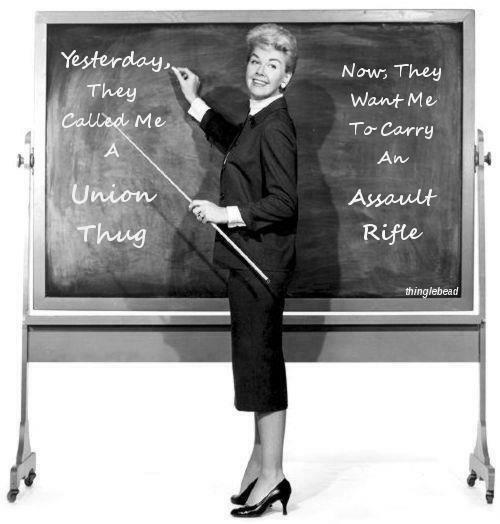 You make a point, but at least you have admitted teachers in NC are in a union. Maybe doing away with gun free school zones so parents can volunteer on a rotating basis is a better idea. If something is valuable you guard it. Be it a bank holding money a museum with rich art displays or a Ferrari dealership, they all use armed guards. What is more valuable then our children's lives? Are they not worth as much guarding as a bank vault? If a crazy person with a gun/guns or bomb or machete is going to attack our children at our schools is not not better that there is someone there to try ans stop him, or to just wait till he is done and hope the loss of lives is not too large. Sally M care to elaborate or just going to stick to your one word posts? Or does you pattern of non nonsensical posts mean you do not think our children are worth protecting ? BRB, does the fact that your bank does not feel the need to protect the money in it, does that make our children's lives less valuable? I was at Lowes groceries today and armed guards carried in bags of cash for making change and deposits. Were those deposits worth more or less then yours my child's lives ? Interesting point, Opoib. It looks like the terrorist sends his kids out with bombs strapped to them to kill people he wants to control and the liberal sends his kids to schools that encourage them being killed because the liberals fight protecting their own children in order to get a crisis that would help them control others. I had never thought of this before.